The United States is mired in an urgent jobs crisis. Despite some early signs of a sustained economic recovery, in many parts of the country the debilitating fallout from the Great Recession on employment remains a painful fact of daily life. Few industries have felt the economic downturn harder than the construction industry, which suffered the most from the consequences of a decade of gross mismanagement of our nation’s mortgage markets and financial services industries. The unemployment rate in the construction industry hovers at Depression-era levels, remaining near 25 percent for three straight months by March of this year. Between 2006 and early 2010, total payroll employment in construction fell by 2.1 million jobs, with residential construction declining by 38 percent, meaning that more than one in three construction workers lost their job as a result of this recession. And this collapse in construction cascades across other industries as well. Construction-related retail jobs fell by 14 percent, and manufacturing jobs in wood products by 30 percent over the same period. Collapsing demand for labor in construction industries is devastating to American families and communities nationwide. To confront this crisis, the U.S. jobs market needs sustained new demand for the skills of construction workers that is grounded in providing real value to the economy through enhanced productivity, greater efficiency, and improved asset value for real estate. For that to happen, we need a sound strategy for investment in our nation’s stock of residential and commercial buildings—a strategy that will get banks lending again, put construction crews back on the job, and improve the long-term economic value of buildings for homeowners, businesses, and investors alike. Such a solution is readily available. 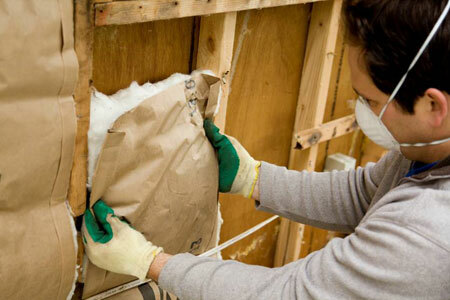 Our country needs a national program to retrofit America’s homes, offices, and factories for energy efficiency—a program that can provide an important answer to the jobs crisis facing our country (see box on page 2). But it will take public policy leadership to mobilize the private sector investment that is needed to grow this emerging market. Fortunately, many states around the country are already demonstrating that with public sector leadership it is possible to jumpstart market demand for energy efficiency retrofits of our homes and businesses. In this paper, the Center for American Progress and Energy Resource Management look at state regulations and incentives for energy efficiency that are working today in leading states to accelerate demand for energy efficiency services, businesses, and ultimately jobs. As this market rapidly grows in coming years, states that have put in place strong policies for energy efficiency will be best positioned to capture these new employment opportunities for construction workers in clean energy. Despite the growing state leadership documented here, however, more must be done to capture the full potential of energy efficiency to serve as a national engine of reinvestment and job creation. Choices in policy can have a tremendous impact on setting the market conditions that entice private sector investment and put skilled construction workers back on the job. This paper identifies 10 policies that are effectively used in states and can have an especially large impact in shaping the market for energy efficiency. Using a state-by-state analysis of existing policies (including both regulations and investment incentives), as well as market conditions (including energy prices and building stock), the Center for American Progress and Energy Resource Management identified the leading states where smart policies are poised to set the stage for clean energy jobs and the homegrown businesses that will serve this new demand. These leading states can be found in every region of the country, in states with high- and low-cost sources of energy, and in both heating and cooling intensive climates. The key driver of these markets for efficiency is the presence of policies and market prices that allow businesses to profitably recover the cost of their investments in productive, innovative, and cost-effective energy efficiency measures. None of these states has put in place the entire suite of policies, and each is only now beginning to develop the potential of energy efficiency to create a robust market for clean energy jobs. But these states have developed important pieces of the puzzle. In the pages that follow we will detail how we chose the “Top 10 Energy Efficiency States” and identified an additional “Top 10 High Market Potential States” that also could be poised to assume leadership in building energy efficiency as a new industry and source of increased economic competitiveness. For other states that do not appear on this list, policy innovations could rapidly create the structures for energy efficiency as a growth business sector. Our rankings looked specifically at the potential market for energy efficiency, especially for the underserved commercial building market segment. A significant factor in determining the market potential for energy efficiency is energy prices, and it is important to realize that some of the most successful market structure innovations undertaken have been in states that rank relatively far down on our list, or even out of the top 10, because their retail energy prices are below the norm, slowing the recovery of investments in energy-saving measures. For other states that do not appear on this list, following this path of policy innovation could rapidly create the structures for energy efficiency as a growth business sector. Energy efficiency measures in Renewable Portfolio Standards—policies that not only require utility companies to meet a set portion of demand from renewable energy but also include energy efficiency as a qualifying form of clean energy. Energy efficiency measures in Renewable Energy Credits—policies that establish markets for tradable clean energy credits and include energy efficiency as a qualifying clean energy resource. Energy efficiency specific standards that require utilities to plan for meeting a percentage of future growth in demand through energy efficiency instead of increasing supply. These policy tools include Energy Efficiency Resource Standards and Energy Efficiency Portfolio Standards. Unbundled utility structures in which energy transmission and distribution utilities are separate from power generation companies that own power plants, encouraging least costs strategies for meeting energy demand through conservation. Decoupled utility rate structures, where utilities’ rates are adjusted to compensate for changes in the volume of energy sold, removing the structural disincentive to conserve energy. Aligning efficiency with utility companies’ shareholder benefits, such as bonus rates of return, reimbursing program costs, or other incentives that help transform efficiency from a special program into a core business practice. Penalties for noncompliance with energy efficiency standards, to ensure that well-intentioned programs are effectively implemented, monitored, and improved upon over time. Effective policies must have real consequences. Regulatory cost-benefit tests that focus on utilities’ real costs, in order to isolate the specific value offered by energy efficiency investments. Property-assessed financing structures that link the benefits of installed efficiency to a building, rather than the owner of the building, allowing repayment of financed investments to transfer automatically to new owners. Service assessment delivery structures, which allow government jurisdictions to directly facilitate financing of upfront capital costs, assuring repayment through municipal or other service assessment mechanisms. As we will demonstrate in this paper, these policies enacted at the state level (in different mixes in different states) are already providing numerous real-world examples of how policy-driven energy efficiency markets can create a new industry to power job creation in the construction sector profitably and sustainably. These same policies help to combat global warming and lower our nation’s reliance on foreign fossil fuels—both important national goals. But make no mistake: No state has fully developed the potential of their energy efficiency market to create clean energy jobs, let alone the federal government. As a country, the United States substantially lags behind our closest economic competitors in the energy efficiency of our economy. We believe the examples presented in this paper can set the stage for a powerful new national energy efficiency strategy, which fixes market barriers to unleash entrepreneurs, investment, and innovation. This is must reading for anyone interested in broad-based job creation and economic prosperity, enhanced national energy security, and a clean, sustainable environment powered by new ideas, new private capital and fresh policy prescriptions for the 21st century. Whether we are motivated by economic, national security, or environmental concerns, a national commitment to energy efficiency will create substantial new demand for labor across the economy, and especially in construction and construction-related manufacturing jobs. Investing in energy efficiency provides economic benefits in other ways as well. Increasingly efficiency means state-of-the-art buildings, enhanced comfort, better health, and improved economic value. Highly efficient “green” buildings use less energy, attract higher rents, spend less time vacant, and command higher prices at the time of sale. Energy cost savings and well-designed financing structures also reduce net building operating costs permanently. Energy efficiency is driving innovation in business models as well. As entrepreneurs generate value and profit by mining current inefficiency and waste for new economic opportunities, they improve the competitiveness of the broader economy. And increased efficiency makes both homeowners and the economy as a whole less vulnerable to fluctuations in energy prices, while advanced building materials and cutting-edge information technology for better building management represent fast-growing markets for American manufactured products. Smart policies for energy efficiency can be not only an engine of economic recovery but a catalyst for innovation as well. Bracken Hendricks is a Senior Fellow at the Center for American Progress, Bill Campbell is chair of Energy RM, and Pen Goodale is the Director of Research for Equilibrium Capital Group.